Assad is a unifying figure for at least 80% of the population, who see him as a secular modernist and a progressive reformist, far removed from the medieval madness that the ISIS and other Islamists want to drag towards. 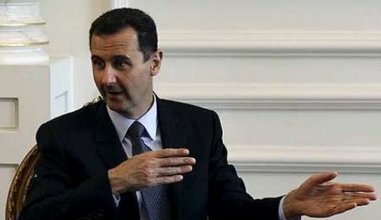 Despite the fact that even Western Media sources, including the NATO, have consistently pointed to the fact that Syrian President Bashar al Assad enjoys 70% of popular support, the infantile pompous rant of “Assad Must Go” continued for over the course of the last 4 years and more from the Imperial-Zionist capitals and those of the Collaborator Gulf Monarchies and Turkey. The fact that since then, having failed at “Regime Change” Sources from the Le Figaro, the Guardian, NATO itself, to the warmongering Fox News, have all presented figures that have proved contrary to their very own dose of daily Goebbelsian propaganda and lies. Having failed at “Regime Change” after imposing a genocidal destructive war on Syria, now the operative term has changed to”Transition”, with an arrogance and disdain for the popular will of the Syrian nation. The fact that the Syrian State responded to the crisis by initiating a political dialogue with cross-sections of the Syrian political parties and community organization, engaging in a process of Constitutional and political reforms, which after a year of debate and discussion led to a national referendum in May 2012, has never been mentioned in the biased warmongering Western Corporate Media. A Constitution that ended the monopoly of the Baath Party, that opened the doors for the deepening and broadening of a Multi-Party democratic electoral system, the right to dissent, to protest, freedom of expression, greater powers and rights to the Media, opening the doors to Private Media, more rights to the citizenry, Gender rights, the various religious and ethnic minorities, were the hall mark of the Constitution adopted in 2012. The only path ahead for the transition to a more advanced secular democracy was a political process and not an imposed external war. But the Arab Gulf and Western powers were ware of the strength of the Syrian nation, the popularity and deep roots of the Socialist Baath Party, thus elections and political reforms were never the preferred path. But Libyan-Style Regime Change was certainly the option, having toppled the Gaddafi Government by financing, mobilising and arming the Al Qaeda and other Islamist forces. This religio-sectarian strategy failed in Syria, both militarily as well as politically. The Syrian Government then responded with elections that were held in June 2014, in which 73.6% of the people participated and 88% overwhelmingly voted for President Assad. The fact that Bashar al Assad is the most popular leader in Syria is a no-brainer, but the fact here that more than 73% of the people participated in the national vote is of more significance here. The fact that people came out in droves to vote, with tears in their eyes, with a commitment and an enthusiasm, with the pain of national suffering in a war that was imposed upon them. Their vote for the unity of their nation, for their popular President, who has led the country through its worst crisis in its modern history, who continues to appear publicly despite the imminent threat to his very life, has only added to his popularity amongst the Syrian nation. Assad is a unifying figure for at least 80% of the population, who see him as a secular modernist and a progressive reformist, far removed from the medieval madness that the ISIS and other Islamists want to drag towards. Remarkably, Syria and Assad have emerged as a nation of destiny, around which the geopolitical balance of the world is being defined and undergoing great shifts and geostrategic changes.